Black Pepper: Beef, beef hearts, water, salt, corn syrup, spices, monosodium glutamate, dextrose, citric acid, garlic powder, natural hickory smoke flavoring, sodium erythorbate, sodium nitrite. Beef and Cheese: Beef, beef hearts, water, American cheese, salt, corn syrup solids, spices, monosodium glutamate, dextrose, citric acid, garlic powder, natural hickory smoke flavoring, sodium erythorbate, sodium nitrite. Caliente: Beef, water, jalapeno pepper, salt, corn syrup, spices, monosodium glutamate, dextrose, citric acid, garlic powder, natural hickory smoke flavoring, sodium erythorbate, sodium nitrite. Black Pepper: Starting out smooth, with a meaty, salty flavor, the black pepper spice picks up after a few chews and creates its signature burn and aftertaste in the back of my mouth. There's actually quite a bit of black pepper flavor in this. Aside from that, there's a faint bit of sweet and tangy chew, hints of garlic and smoke flavoring. Beef and Cheese: Starts even more smooth than the Black Pepper, this one however doesn't get as spicy. I didn't encounter any bits or pieces of cheese, however. Instead, the cheese is blended into the meat, giving it more of a creamy texture that coats the roof of my mouth like Velveeta. Further into the chewing, there actually is a light bit of spiciness in the back of my mouth, indicative of black pepper. But overall, it's still mild. Caliente: Starts out with a recognizable jalapeno pepper flavor and picks up in heat soon thereafter. This has one has the same smooth feel as the other two flavors, but is definitely the most spicy of the three. Like with the Black Pepper, there is also a touch of sweet and tangy chewing and a lightly noticeable garlic. Tender and most as with the other beef sticks flavors offered by Pap's, these new flavors still have a nice weighty, meaty feel. They're not greasy like with many of the national brands, and they have a nice crunch when I bite into them. These sticks have a nice semi-moist consistency without being sticky. 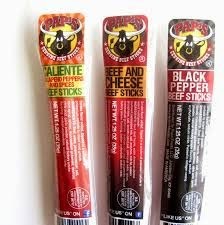 Unlike some other brands, these sticks from Pap's don't give off a strong odor, with only the Caliente having a light chile pepper aroma. 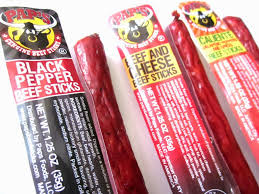 Pap's Genuine Beef Sticks can be purchased from its website at a price of $34.99 for an 24-count box, with each stick weighing in at 1.25oz. Shipping is currently free, but is not known how long that will last. to Southern California comes to $9.00, for a total cost of $36.00. That works out to a price of $1.17 per ounce. For general meat stick snacking purposes, at the $1.17 per ounce price, it's seems to be a good value. I get a decent level of snackability for its satisfying flavor, but more so for its soft, tender chew, nice snap of the casing, and clean eating. Considering it's all beef without any fillers perhaps makes it more valuable as a protein snack. Compared to other meat sticks sold in convenience stores, it's similarly priced, yet it provides a better meat stick experience. I'm giving these new flavors a good rating. These new beef stick flavors from Pap's Beef Sticks provide a better snack value for your dollar with a cleaner handling, meatier flavor than other national brands. I liked the meaty and lightly sweet and tangy chewing that seems consistency through all three flavors. I particularly liked the Caliente variety with its jalapeno pepper flavor. The Black Pepper variety was good with its identifiable black pepper flavor, but didn't seem to go far enough for me in flavor. The Beef and Cheese was not my favorite due the cheese-food coating it left on the roof of my mouth. But then again, I haven't found a "beef and cheese" variety of meat snack that I've liked.